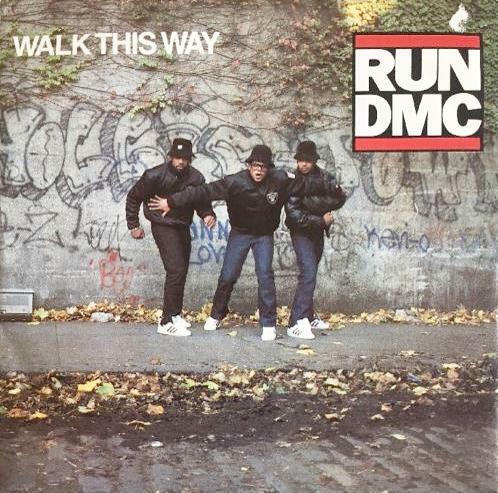 RUN DMC FEaturing AEROSMITH "WALK THIS WAY"
Who would ever of thought that a 70s rock song would be responsible for helping hip hop music to break into the mainstream? Well, it did just that, as well as reviving the musical career of a struggling rock band who were big in the 70s, but were disappearing into obscurity in the 1980s. The song was originally released in 1975 by Aerosmith as their eighth single, although it failed to chart in either the UK or U.S. Featuring on the band's third studio album Toys in the Attic, a re-issue in November 1976 reached No.10 on the Billboard Hot 100 in early '87. The single reached No.85 in the UK. However, it was the ingenious and iconic hip hop/rap/rock crossover collaboration by RUN DMC and Aerosmith that became the most successful and best-remembered version, reaching No.4 in the U.S., making it the group's only top ten hit here and the first hip hop song to reach the top 5. In the UK, the single was the first of two top ten hits, reaching No.8 - the group reached No.1 in 1998 when they teamed up with Jason Nevins on the single "It's Like That". Aerosmith members Steven Tyler and Joe Perry also performed on "Walk This Way", which was released as the second single from RUN DMC's third studio album Raising Hell. The lead single was "My Adidas", the third single was "You be Illin'" and the fourth single was "It's Tricky", which was the only other single from the album to break into the UK Top 40, reaching No.16. "Walk This Way" entered the UK singles chart at No.37 on 31st August 1986, making it the fifth highest new entry that week. The single reached a peak position of No.8 for two weeks starting on 21st September. During this time, The Communards were at No.1 with "Don't Leave Me This Way". RUN DMC's producer Rick Rubin played the original Aerosmith song to the group and suggested they rework it. The only member who was open to the idea was Jam Master May. After recording the track with Aerosmith, the band were not keen for it to be released as a single, and were, apparently, pretty shocked when they heard it being played on both hip hop and rock radio stations. Rubin actually phoned Aerosmith's manager Tim Collins to ask him about reworking "Walk This Way" into a rap song. Collins replied "What's rap?". The new version was created in just one day at Magic Ventures Studio in Manhattan. It had to be done quickly, though, because RUN DMC had rented a car to get them there, at the cost of $8000 per day! Directed by Jon Small, the video features a musical battle between both groups in neighbouring rooms, with a dividing wall in between. It starts with RUN DMC bashing the wall and asking Aerosmith to "turn it down" as they are performing the song. Just as Stephen Tyler is about to sing the lyrics, RUN DMC kick in with their rap, silencing him. Tyler eventually smashes his way through the wall with the bottom of his microphone stand to sing his part through to the group, sticking his head through the hole he created. In the next scene, Aerosmith are performing the song on a stage in front of a crowd, RUN DMC burst through a paper screen at the top of the stairs and perform their rap part. Both groups eventually join each other on the main stage. The only members of Aerosmith to feature in the video were Tyler and Perry, with the other rock musicians, J.D. Malo, Roger Lane and Matt Stelutto, not actually being band members. As already mentioned, the single was responsible for boosting Aerosmith's flagging musical career. The band were going through a pretty rough patch at the time, with band members struggling with alcohol and drug abuse issues. Also, their 1985 comeback album Done With Mirrors was a disappointment in terms of commercial success, achieving a gold sales certificate and reaching only No.36 in the U.S., despite favourable reviews. After the success of "Walk This Way", the band released a hugely successful album in 1987. Permanent Vacation achieved 5 x platinum sales in both the U.S. and Canada. The band also achieved further success with the albums Pump (1989) and Get a Grip (1993) which both achieved 7 x platinum in the U.S.